Tobins' Tastes: Weekly Shopping Totals Link Up: Saved 58% at Publix- Cheap Milk & Free Butter! 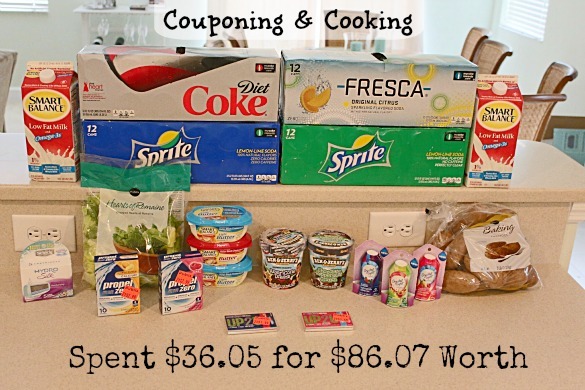 Weekly Shopping Totals Link Up: Saved 58% at Publix- Cheap Milk & Free Butter! We really could have skipped going to Publix this week. We have plenty of meat in the freezer, bread in the freezer, a full pantry, and tons of veggies in the freezer too. I decided to go and grab on last set of the B2G2 Free Coke products deal since we just ran out of Sprite and I was happy to find the Celebrate Summer coupon booklet in my closest Publix store which meant I could finally take advantage of the free Smart Balance Spread deal and grab some cheap milk too. I was a little annoyed that I spent over $30 today for what looks like so few groceries but considering the fact that the four 12 packs of soda and the razor cartridges alone cost over $36 I shouldn't feel too bad : ) I did hit over $60 in my two separate transactions before coupons (which I didn't think I would, but my Publix considers my total before coupons and before the B2G2 Publix $10+ promo came off the receipt) I once again got to use two $5/$30 Winn Dixie coupons. I had a fun Target trip on Monday and spent $33 so between my two trips this week I did spent over my preferred $50 a week but I was able to stay under my actual $80 a week cash budget so I am happy.